AMMAN, Jordan (CNN) — For more than 20 years, Cardinal Joseph Ratzinger, then the Vatican’s top doctrinal czar, was the intellectual architect of the papacy of John Paul II. While John Paul II was a bridge-builder, Benedict is determined to walk across those bridges, pushing Islam toward a rejection of extremism and an acceptance of religious freedom — toward an integration of reason and faith. It’s an approach that puts its finger on critically important concerns, but one also fraught with potential for conflict. John Paul’s opposition to the two U.S.-led Gulf Wars and his broad sympathy for the Palestinians was also appreciated by many Muslims. His broad vision is what he calls growing “intercultural dialogue” between Muslims and Christians, which implies an alliance against forms of secularism in the West that the pope regards as hostile to religion. 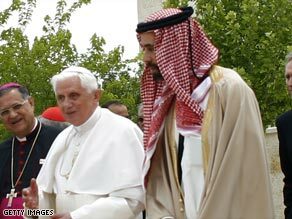 The fact that Benedict XVI has chosen to begin his tour by spending three days in Jordan, which the Vatican has long regarded as a model of Muslim-Christian co-existence, suggests the emphasis he places on Islam. When John Paul came in 2000, he spent just 24 hours here. To date, Benedict XVI’s efforts to convince Muslims that he’s advancing these arguments as a friend, from a shared space of common religious concern, have brought mixed results. Here in Jordan, some leaders of the Muslim Brotherhood have turned a cold shoulder to the pope’s visit, insisting that he must apologize anew for the Regensburg address.